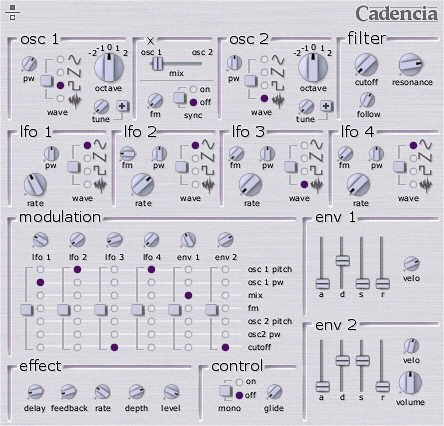 Cadencia is a 2 oscillator analog synthesizer. It featuresa 4-pole 24 db/octave filter, 2 ADSR envelopes, 4 low frequency oscillators and a built-in stereo delay/flanger effect. It’s a pretty simple synth, however Each LFO can affect the rate of the adjacent LFO – so it’s possible to modulate the basic parameters in fairly complex and unpredicatible ways.